In theory, I am in the camp that Valentine’s Day is over commercialized and that you should treat your loved ones with sweetness every day of the the year. In practice, however, I love the red, white, and pink hearts, boxes of chocolates in sweet packaging, and bouquets of flowers that come with the Hallmark-esque Valentine’s Day that we celebrate. Whoops. Now, even though I am single this Valentine’s Day I wasn’t about to let that stop me from sharing my wishlist if I actually did have a sweetheart to spoil me! 1. This Red Turquoise Necklace. I love a statement necklace and this handmade one would look amazing with a simple top, a pair of jeans and a killer pair of heels! 2. A Pair of Pink LuluLemon Grove Pants. You already have seen how much I love LuluLemon’s shorts and you can’t go wrong with a pair of yoga pants. They are super comfortable and your sweetheart will love to see your curves hugged in just the right way! 3. A Le Creuset Heart Baker. I love Le Creuset for the kitchen, most of the pots you see in my recipe posts are from the brand! 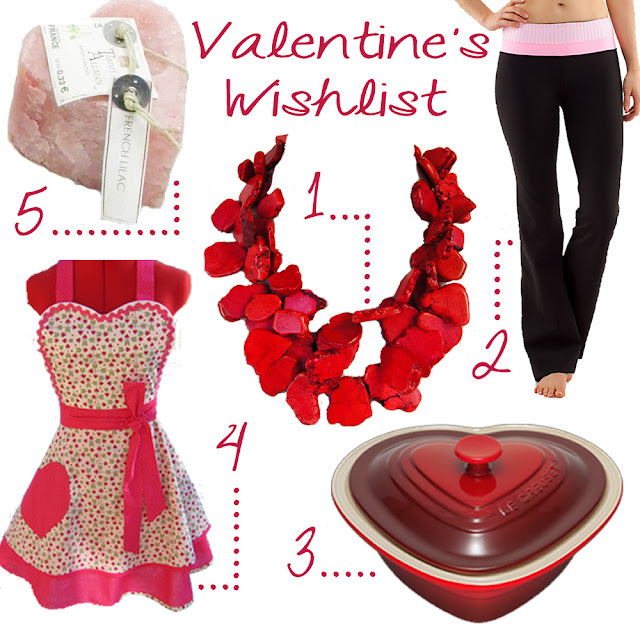 A heart shaped casserole would be a perfect Valentine’s Day dinner idea! 4. A Valentine’s Day Themed Apron. I love the retro-apron look. I have a battered old apron for everyday use but dinner parties with cute aprons? Yes please! 5. Heart Candles in French Lilac. I love handmade candles, candlelight makes everyone look good and you know love went into making them! Plus, lilac is one of my favorite scents- right up there with old book smell and the smell of dirt after it rains! Aww, that apron is too cute! I'm looking forward to a couple's massage and dinner with the boo this evening! Happy Valentine's Day! Woooo! I love that apron! I'm always baking or cooking something and this one looks supah cute! Oh I do love that necklace! Its stunning! Lovely wishlist, nothing else to add)))) Thanks for sharing such a nice post! Also a very large 'thank you' for taking the time to leave a comment for me! You are right about my Varsity jacket, in fact I am aRed Sox fan too…my boyfriend lived in Boston for a while and I loved the city too! Everything look great! Lovely wish list! That candle looks so cool! I'm sure it smells lovely too! And what a gorgeous statement necklace! Your wishlist is perfection, I want every single item you covet for, especially the necklace and the pants, they would all be an amazing addition to any wardrobe. Your have a lovely blog by the way and I am a new follower on GFC and Bloglovin! Hope you will like my blog and follow back!